Last year my predecessor Monique conducted an intriguing interview with poet Mark Lavorato about his upcoming collection, Wayworn Wooden Floors. Well, the publishing world never stops turning, and while Monique was working with Mark’s manuscript back in September, we just started shipping copies of his book out of the shop this June. Wayworn Wooden Floors, by Mark Lavorato. 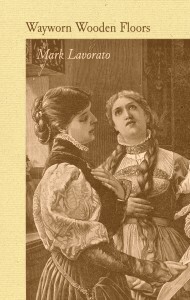 Anyone that has been following us on facebook or twitter will know that Mark Lavorato has been a very busy poet indeed. This month he has three events planned for the release of Wayworn Wooden Floors. In addition, we have been working together to coordinate online features for Mark on the 49th shelf, Open Book Ontario, and Open Book Toronto. For the poetry keeners out there, you can catch Mark in Montreal on June 14 at Argo Bookshop and on June 19 at Paragaphe Bookstore. Read more about these events on our events page here. You can also catch Mark in Toronto on June 21 at Nicholas Hoare Books. I’ll be there too, so I’d been delighted if you would come by and say hello. Our dedicated fans will likely already have read Monique’s interview with Mark, posted back in December of 2011. But for those of you who haven’t, I encourage you to go and have a looksee. Mark provides an interesting perspective on poetry today and its relationship to the public. For example, Mark considers poetry to be becoming more 21st-century friendly all the time. As he sees it, poems are literature’s version of the micro information we are always sending at each other on facebook and twitter. Poems are like YouTube snippets, iTunes samples, and facebook posts. I am always hearing people say that our attention spans are shrinking (and when I was reading Victorian novels during my undergrad, I found myself thinking it plenty, too); it might be that as we come to expect less and less, poems will become more and more important. It rained enough that everyone knew his underwear bore brightly coloured polka dots. This was the revenge of his linen suit. And his hubris. When I really start thinking about it, people in publishing are always telling me I have to hurry up. “You only have 30 seconds to make this pitch,” or “When a customer is browsing you only have 7 seconds to grab their attention.” Geez Louise. Then consider those people who are always rushing the doors on the TTC and getting their briefcases caught in the crush: half on them in the train, half of them still on the platform at St Clair…. Perhaps Mark Lavorato is onto something, perhaps we are all just trying to go faster, faster, faster. Well here’s your chance to tell me what you think. Comment on this post and let me know what you think for the chance to win a free copy of Wayworn Wooden Floors. Do you think our attention spans are getting shorter? A simple yes or no will suffice, but I’d love you to go on and on about it. Consider this one of your last chances in the 21st century to be prolix. Contest closes June 15, so get commenting. Congratulations to the winner of our last contest Rachel Geertsema. Stay tuned for more fun contests from the Quill in the months to come…. And don’t miss Mark Lavorato in Montreal and Toronto later this month. Until next time … Porcupette out! Wayworn Wooden Floors is now available for sale from an independent bookstore near you. Basu, Arjun. arjunbasu. 31 May 2012. [http://arjunbasu.com/twisters]. Davis, Lydia. Varieties of Disturbance. United States: Farrar, Straus and Giroux, 2007. This entry was posted in Letters from the Porcupette (the Intern's Blog) and tagged Arjun Basu, Lydia Davis, mark lavorato, Twisters, Varieties of Disturbance, wayworn wooden floors. Bookmark the permalink. i love what this press is doing…and doing…and doing…impressive work indeed! Delighted to see this book in print. Another fine Porcupine’s Quill volume. It might not be that our attention spans are getting shorter but, rather, that there are simply more things vying for our attention these days. Presenting information in short snippets makes it attractive to people who are really busy. What an excellent point Kathy. There is certainly more going on these days than, say, one hundred years ago. Shortening information is the best way to make sure it gets your audience’s attention. The “Sesame Street” generation is now buying it’s own books – those raised on rapid-fire quickly-paced information streams with changing subject matter. They are the bane of education today. If teachers haven’t hooked their students in thirty seconds, attentions beging to wander. Poetry may well become the literature of choice – quick, attention grabbing, and it doesn’t take the first fifty pages to get the reader’s attention….